Residents were forced to dig snow tunnels to get around Main Street. The winter of 1898 was one for the (very new) history books in Breckenridge, Colorado. The gold mining town, as it was back then, was home to several businesses - including barber shops, watch repair shops, hotels, and general stores. Its population was mostly those who had arrived for the gold rush to mine ore from the nearby mountains. Snow fell in the town for 79 straight days, piling up past business doors, in a historic snowfall documented in images from 1898-1899. There was so much snow, residents were forced to dig tunnels through Main Street. 1898-1899. On Main Street in Breckenridge, Colorado, the balcony and second floor of the Denver Hotel show above deep snow. Deep snow below has a hole cut for the hotel's entry, and two men stand in it. On south Main Street in Breckenridge, Colorado, a sign reading "Miner's Home Saloon." Two men on skis with single poles and shoulder bags are in the foreground and a dog is with them. 1898-1899. On Main Street in Breckenridge, Colorado, two men in sack suits and bowler hats approach through a snow tunnel. Power poles behind them suggest a view to the north, rather than what is written on back of photoprint. 1898-1899. Men, women, a child and a dog pose on the snowbank, around a hole that has been dug to the entry, where a woman in an apron is standing. The banker and city treasurer, George Engle, and his wife, Gertrude, approach through a snow tunnel on Main Street in Breckenridge, Colorado. He wears a topcoat, sack suit and gold chain, and fedora hat. 1899. On Lincoln Street in Breckenridge, Colorado, two-story, frame buildings are behind piles of snow in the foreground. A man in a white smock stands at the storefront. 1899. In a snow trench in Breckenridge, a man stands at the end of the shoveled path. Trees and a power pole rise from the flanking snow, and a man and two women stand atop the bank on the right. 1899. On Lincoln Street in Breckenridge, looking west, are two-story, frame buildings behind piles of snow. A man on skis in a white apron and white conductor's cap stands on a snowbank in the foreground. The business on the right has been dug out. 1898-1899. The porch of the Denver Hotel in Breckenridge, Colorado, is possible next to huge snowbanks where fresh snow has fallen. Two men and two women stand under the open porch. The women wear heavy coats and feathered, capote hats. 1898-1899. False fronted stores in Breckenridge are seen through a trench dug in deep snow. A frame business with a "W.B. Stephenson Druggist Paints Oils Glass Wall Paper" sign and "drugs" lettered in the transom over the door is above a snowbank. West side of Main Street in Breckenridge during the winter of 1898-99, a narrow path has been dug out along the storefronts, and deep snow drifts fill the street. Elk antlers are mounted atop a false fronted building next to the Arlington House. On Main Street in Breckenridge, Colorado, in deep snow, the Denver Hotel emerges, and in the background, Fireman's Hall shows above piled snow. A woman on skis in an overcoat stands atop the snowbank at center, holding a ski pole. 1898. In deep snow on Main Street in Breckenridge, a snowbank fills the scene and buildings peek over it. To the right, the Denver Hotel has been dug out. A lathe turned pole with barber stripes has a knob finial and a "Baths" sign topping it. This view of a snow tunnel in Breckenridge is from the winter of 1898-1899, which brought record snow to Breckenridge. This was one of many tunnels that were dug on Main Street to allow passage for the townfolk. A smiling girl looks through. Black-and-white photos show residents shoveling trenches of snow that rises to the eaves of homes. At the Denver Hotel, a two-story structure, workers had to dig out the boardwalk and its entrance. Townsfolk who had to get around on foot, through or over the snow tunnels, used snowshoes, ski poles, and skis to maneuver. 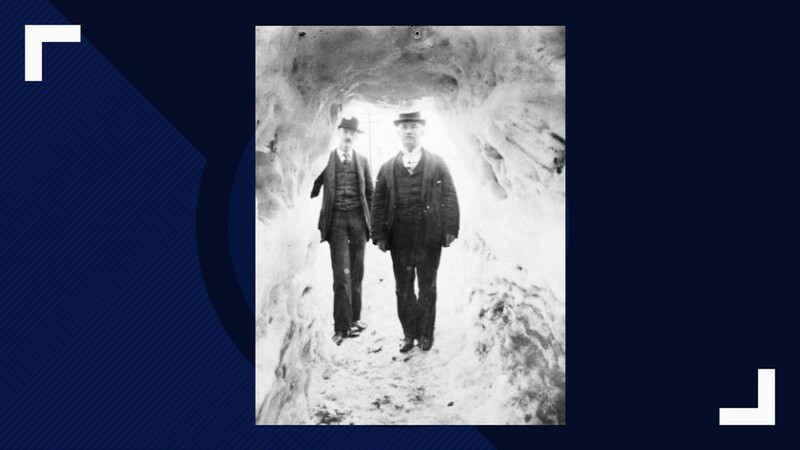 Often, the snow tunnels were well above an average person's height, as shown in this image of banker and city treasurer, George Engle, and his wife, Gertrude, in 1899. He wears a topcoat, sack suit and gold chain, and fedora hat. She is in a puff shouldered bodice and feathered capote hat, with black gloves and dress. The town of Breckenridge was established in the 1880s. Breckenridge was inadvertently left off a U.S. map in the mid-1800s and became known as “Colorado's Kingdom” until the mistake was discovered nearly a half a century later. It was discovered in 1936 that the initial U.S. map surveys had miscalculated the Continental Divide (one survey had it to the west, one to Breck's east). After World War II, the population dwindled in Breckenridge dramatically.